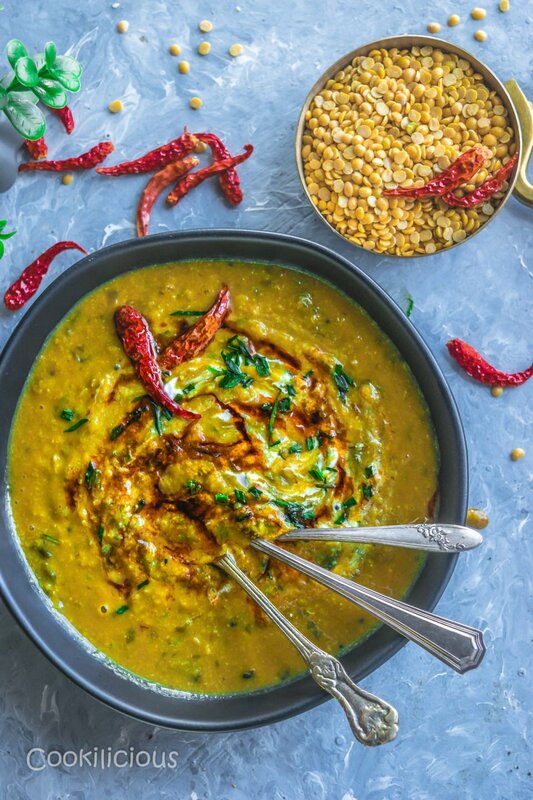 This vegan Malvani Tikhat Dal is an amti style lentil recipe. 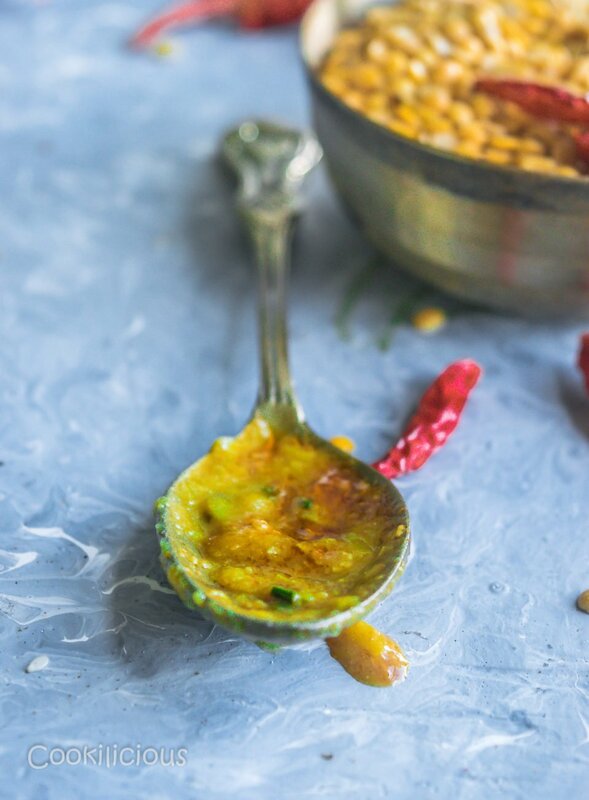 The vatan/ground masala brings out the taste of this dal by giving it a mild flavor and punch! It feels so wonderful to have recreated a recipe that I had in my childhood! In fact, I had forgotten about this dish completely until recently my friend bought it up. Now, everyone around me knows my fixation of discovering recipes that are either long forgotten of family favorites. So, whenever I talk to my family or friends, most are eager to share some new recipe with me and always end with a note to put this recipe on the blog! I however filter those recipes and pick and choose the ones that excite me as a cook. When I was talking to one of my childhood friend the other day, we began chatting about this particular picnic we all had been to. It was on the outskirts of Bombay and this picnic was one a kind for us because that was the first time our families allowed us to go on an overnight picnic with the boys of our building! I know it may sound silly to the millennial population, but some years ago, our parents were a conservative lot and didn’t allow free mingling of boys and girls like it is now. We were a groups of nearly 25 teenagers, all of whom were neighbors as well who went on that picnic. We stayed at a bungalow which was owned by a cute aged couple. They maintained this guest house and served home cooked food to the guests who stayed there. While we have having our share on fun and frolic, they were busy ensuring that our stay was comfortable and we felt at home. The lunch, dinner that day and the breakfast (the next day) we had while we were there was something else! It was a simple homemade food but the flavors were out of the world. We were licking off our fingers and wiping our plates clean because we all had loved what was served. Every dish that was served was delicious and I remember talking about the food for months after returning from that picnic. But then of course, life took charge and eventually it got erased from my memory until this friend of mine reminded me of it. She particularly remembered this Malvani Dal that the lady had prepared that night. Mainly because all of us had loved it so much that we overate and finished all of it. The man of the house jokingly told us that this was his wife’s most popular dish and it always got wiped off clean by the visiting guests. 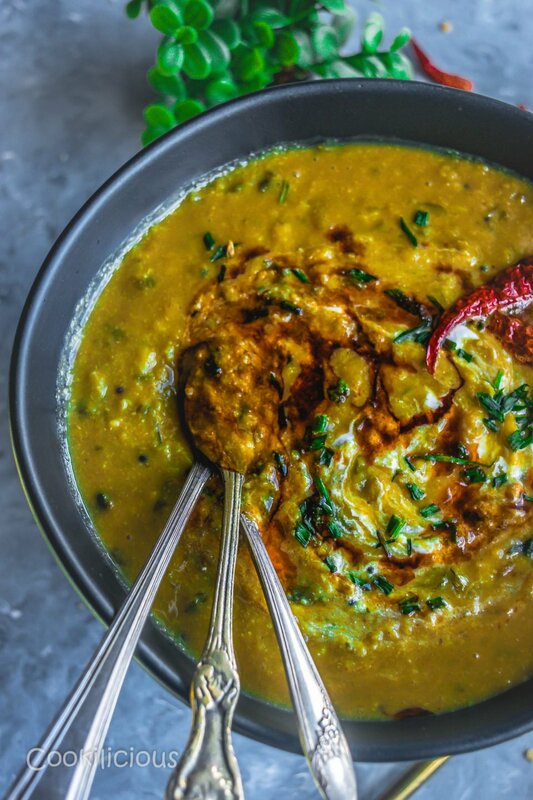 While we all raved about this Dal, my friend went ahead and took down the recipe from her. She now tells me that she has been making this Dal ever since and today her kids love it and insist that she makes it at-least once a week. This came to me as a surprise as I didn’t remember her noting down the recipe but I profusely thanked her that she did! This recipe was surely going to be preserved and shared on Cookilicious for the benefit of everyone. She teased me a bit by not handing over the recipe instantly and only agreed on one condition – that I had to prepare a full seven course meal for her the next time we meet. I gladly obliged to that request of hers and quickly noted down the recipe all the while thinking that this recipe is so precious. Years ago, a lady whom I had not met for more than two days had prepared this dish for us and today her recipe had somehow managed to reach me! Now that is something! 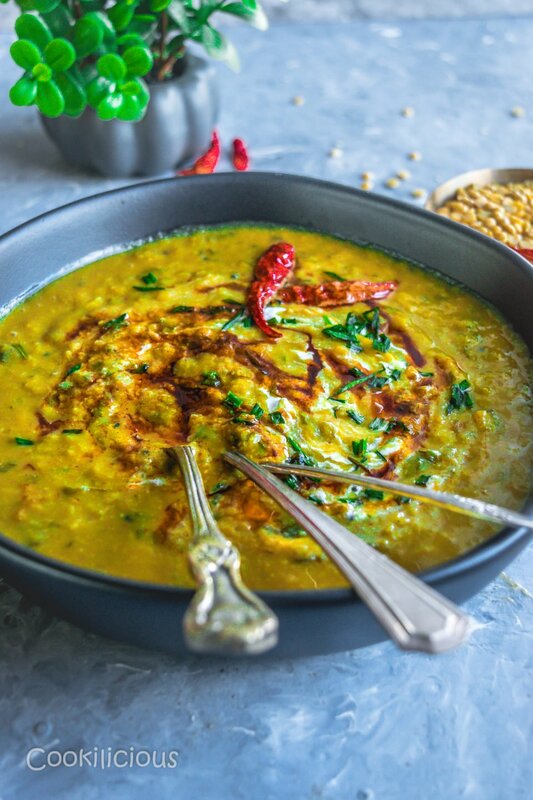 Such a simple yet delicious dal recipe this is that’s cooked in Malvani style! If you do try this recipe, please do share it with your friends on Facebook, Twitter and Pinterest. This will keep me motivated to develop more interesting recipes. Click a pic and post it with the hashtag #cookiliciousveg . I would love to see your pictures on Instagram, Facebook and Twitter! 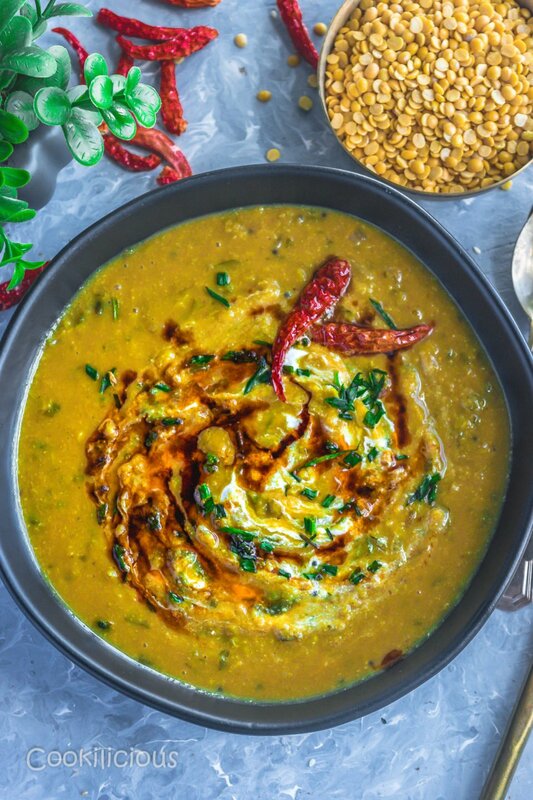 Here is how you need to prepare this Malvani Style Tikhat Dal. To prepare the vatan, add onion, garlic, ginger and coconut to a blender and grind to a smooth paste. Keep it aside for now. Wash and boil tur dal/lentils along with spinach, turmeric powder and salt. Set it aside once done. You can even mash it lightly at this point. In a pan, add oil. Once its hot, add asafoetida and mustard seeds. Once they begin to crackle, add curry leaves, garlic and onions. Saute till the onions turn translucent. Then add Malvani masala, turmeric powder and garam masala. Then add the vatan and mix it all together. Saute till the oil begins to leave the sides. Then add the cooked dal + spinach to the pan along with little water and required amount of salt. Give it a stir and add kokum or tamarind paste. Bring it to a boil and turn off the heat. Malvani Style Tikhat Dal is now ready. 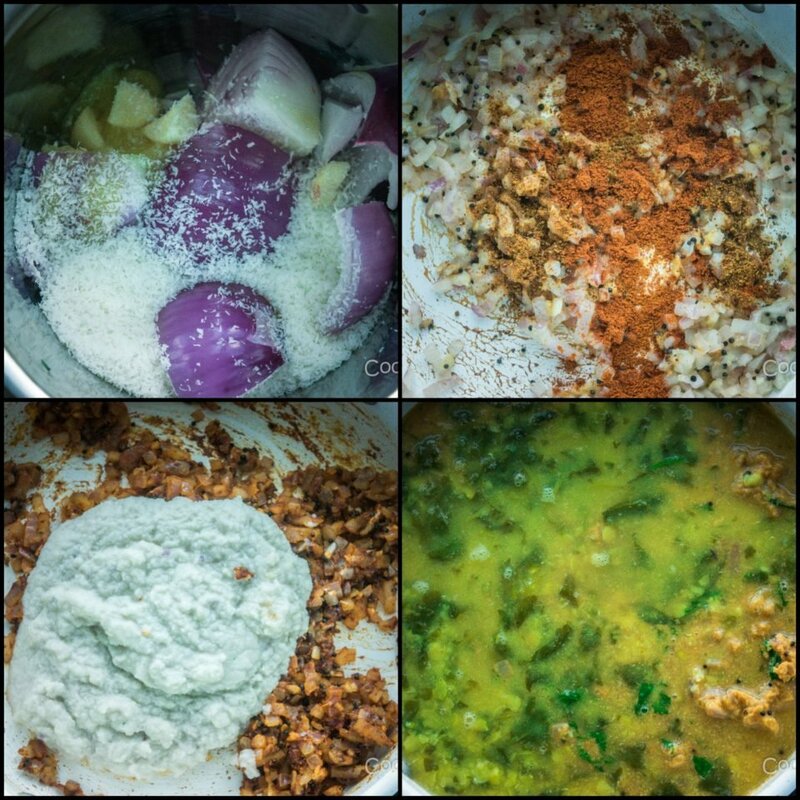 A very different Dal recipe that I am sure you will enjoy too. Serve it with steamed rice or any Indian bread along with some pickle and papad. 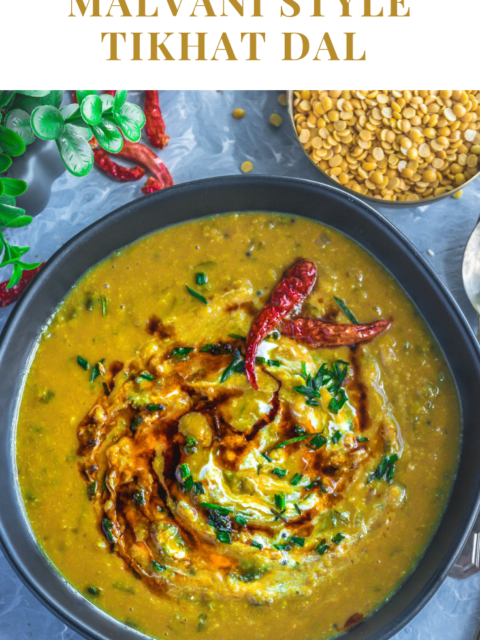 If you too enjoy cooking lentils, then do give these Dal recipes a try – Yellow Moong Dal with Mint & Tomato, Shahjahani Dal | Royal Chickpeas Stew, Methi Dal | Fenugreek Lentil Stew, Maharastrian Kokum Amti/Dal, Chainsoo Dal Recipe, Lasooni Dal Palak/Lentils Soup with Spinach & Garlic, Butternut Squash Dal Tadka, Sultani Dal and Masoor Dal/Pink Lentils cooked with Spinach.